Back at the CES 2019 a fortnight ago, HEXUS saw some new Phanteks chassis debut, ahead of their official launches. Today, Phanteks has fully unveiled the new Eclipse P600S chassis, one of the key products on show at its Las Vegas suite. Interestingly the new P600s is designed to operate in one of two interchangeable modes; a 'silent' stealth mode, or a high performance mode with superior airflow – this makes it a 'hybrid design'. The change between performance and silent modes should be quick, with the magnetically attached front and top acoustic panels, or 'sound dampening insulation' designed with an eye on convenience. You can see the finger friendly cut-out areas on these panels in the images. Without these panels the Phanteks fabric mesh has a lot more exposed surface area to facilitate the flow of cooling air. 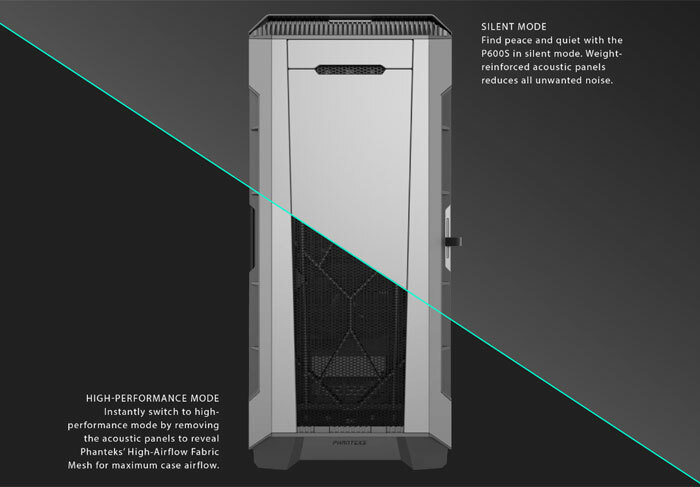 Other key features of the Phanteks Eclipse P600S chassis are its; hinged tempered glass panel, dual system support, optimised cable management, PWM fan controller hub, vertical GPU mounting support, modular silent covers, and extensive liquid cooling locations. 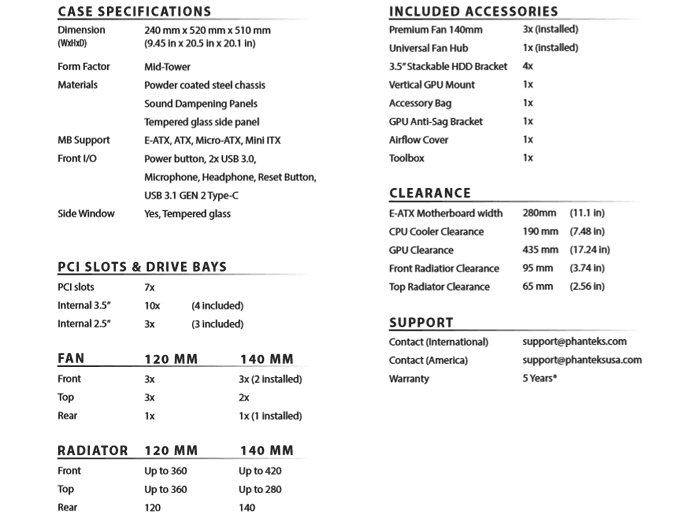 Full tech specs are provided above, with max compatibility measurements listed under the 'Clearance' heading. It is worth noting that Phanteks provides the following accessories in the kit; 4x modular 3.5/2.5-inch HDD brackets, 3x premium 140mm fans, 1x vertical GPU mount, 6x zip ties, all the screws and standoffs you will need plus a Phanteks logo badge. 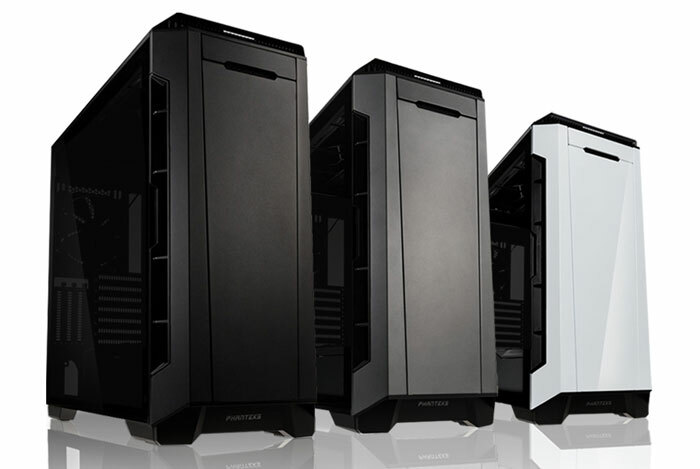 In its email to HEXUS, Phanteks said that the new Eclipse P600S chassis would become available from February in Satin Black, Anthracite Grey, and Glacier White. The MSRP has been set at £134.99 (or at £127.99 for a black model without a window). Buyers get a five year warranty. Not a fan of tempered glass and I still use 5.25" bay mods, but that case has so many other cool features, it'd be a very tempting purchase… especially at that price! That's not a 5.25 bay, it's a cover for buttons/connectors. Yes, I know. I read the article.